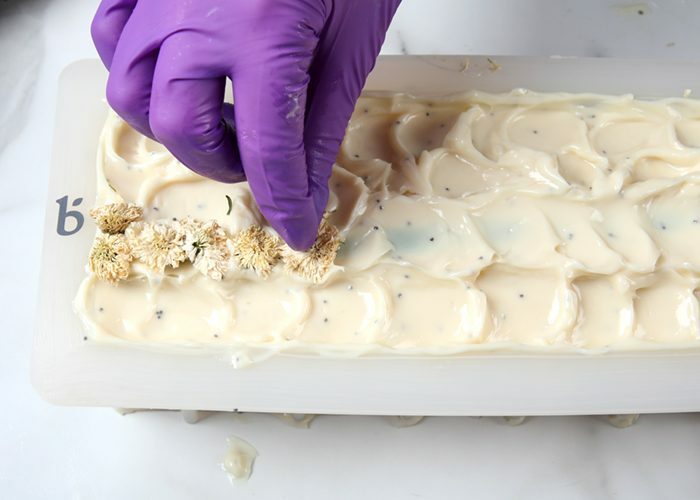 This Chrysanthemum Cold Process Soap is made with melt and pour embeds and chrysanthemum flowers to create the appearance of a flower and stem. Poppy seeds add exfoliation, and White Lily and Aloe Fragrance Oil gives the bars a fresh scent that's perfect for spring and beyond. 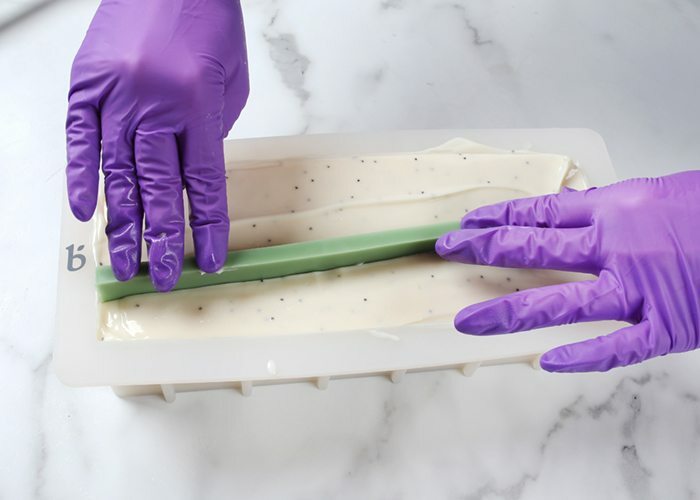 The base of the soap is made using skin-loving ingredients like aloe butter and avocado butter. We recommend using LCP Melt And Pour Soap Base for the embeds. LCP means Like Cold Process because it contains less glycerin than normal melt and pour bases. That means it's less prone to glycerin dew and it's less likely to melt inside the cold process soap base. Learn more about different kinds of melt and pour bases here. 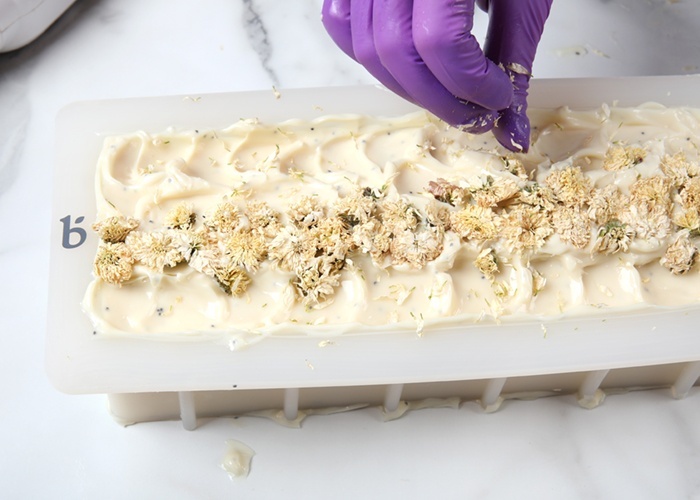 This recipe is made with skin-loving ingredients like aloe butter, avocado butter, and olive oil to create a gentle bar. Poppy seeds add exfoliation. EMBED PREP: Chop 5 ounces of LCP Clear Melt and Pour Soap Base along with 1 ounce of LCP White Melt and Pour Soap Base into small uniform cubes. 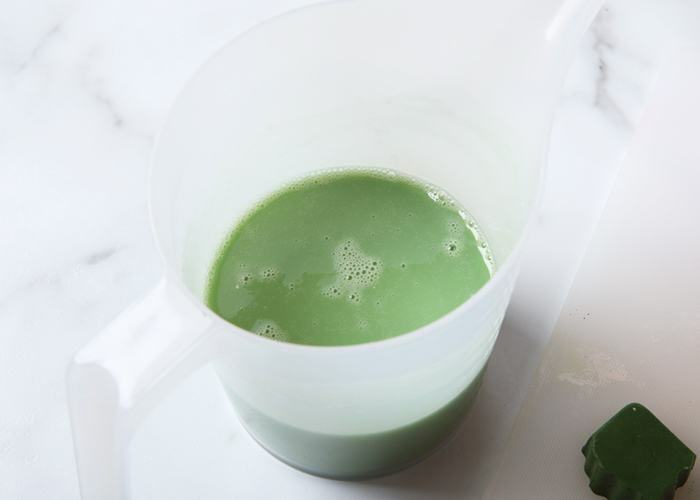 Place it into a heat-safe container along with a chunk of the Green Chrome Color Block. Melt the soap in the microwave using 15 second bursts. Be careful to not let the soap get too hot and burn. If you'd like a more saturated color, add more Green Chrome Color Block. Stir to fully mix in the color. 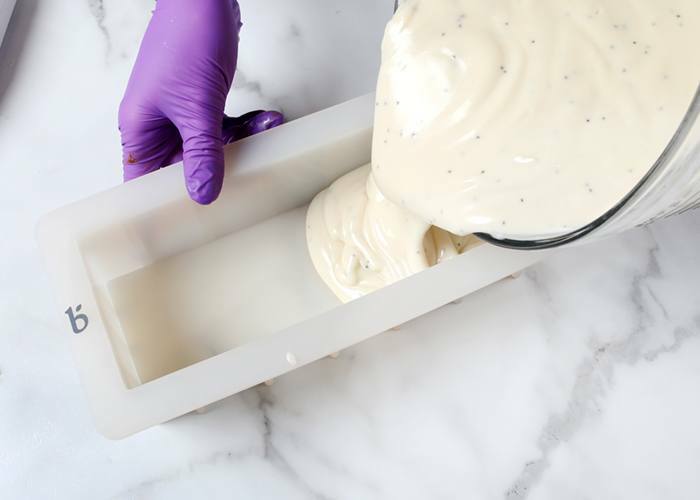 Pour the soap into the bottom of the 10" Silicone Loaf Mold. Allow it to fully cool and harden (about an hour). Remove it from the mold. Place the embed into the mold vertically and trim the top so it's the same height as the mold. Set embed aside. COLORANT PREP: Disperse 1 teaspoon of titanium dioxide into 1 tablespoon of a lightweight liquid oil such as sunflower or sweet almond. FRAGRANCE PREP: In a glass container, measure out 2 ounces of White Lily and Aloe Fragrance Oil. Set aside. Slowly and carefully add 4.7 ounces of lye to 9.4 ounces of distilled water. Gently stir until the lye has fully dissolved. Set it aside to cool. If you’d like a harder bar of soap that releases faster from the mold, you can add sodium lactate to the cooled lye water. Use 1 teaspoon of sodium lactate per pound of oils in the recipe. For this recipe, you’d add 2 teaspoons sodium lactate. Melt and combine 2 ounces of aloe butter, 2 ounces of avocado butter, 13.2 ounces of olive oil, 1 ounce of castor oil, 6.6 ounces of coconut oil, and 8.3 ounces of palm oil (completely melt the entire container of palm oil before portioning) into a large mixing bowl. Once the lye water and the oils have cooled to 130 degrees F or below (and are ideally within 10 degrees of each other), add the lye water to the oils and stick blend the mixture to a thin trace. 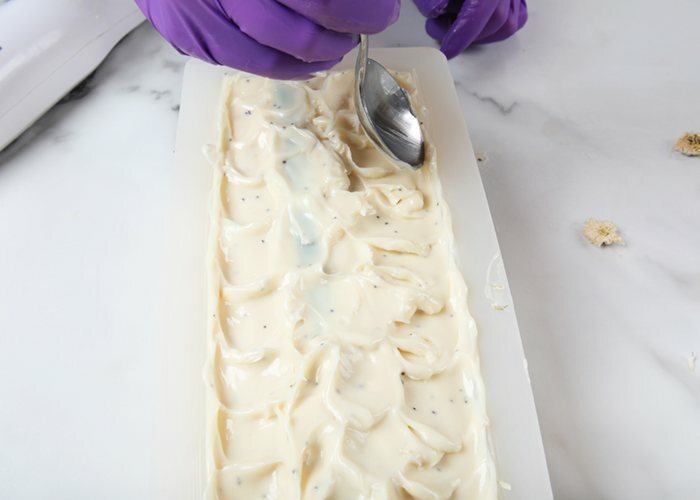 Add all of the dispersed titanium dioxide to the soap and mix in thoroughly using a whisk. 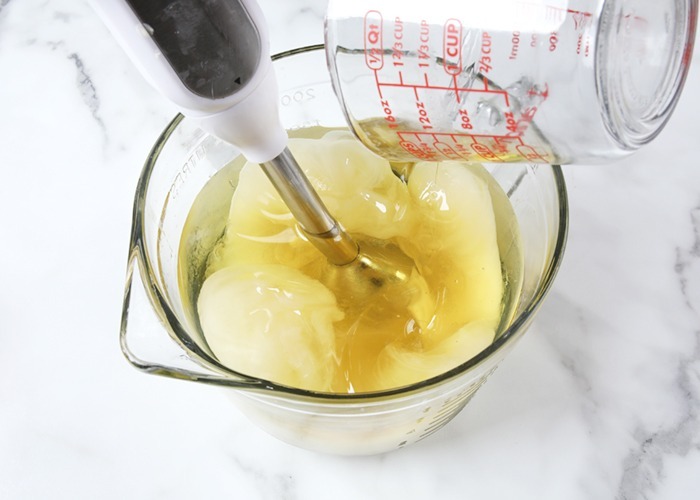 Add all of measured fragrance oil into the soap batter and stir in thoroughly using a whisk. 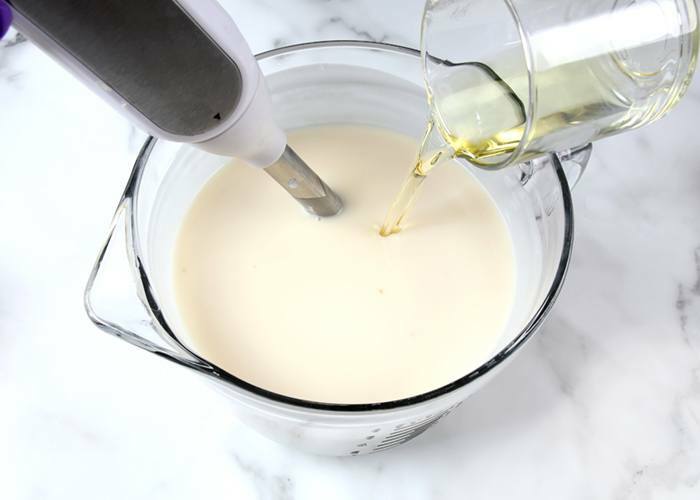 If the soap batter is still at a thin trace, pulse the batter with the stick blender using short bursts until it reaches a medium trace. This thicker texture will help the embed stay in place. Add 1/2 teaspoon of poppy seeds and stir in thoroughly using a whisk. Pour all of the soap into the mold, and tap the mold on the counter to help get rid of bubbles. Insert the green melt and pour embed into the soap. We inserted it at a slight angle so that the stem would be in a different part of each bar when cut. Use a spoon to give the soap texture and make sure the top of the embed is covered. Place chrysanthemum flowers on top of the embed until it's completely covered. Continue to place flowers into the soap until you're happy with the look. Spritz the top of the soap with 99% isopropyl alcohol to prevent soda ash. Leave the soap uncovered - you don't want it to get too hot because the embed can melt. If you live in a very hot climate, place the soap in the fridge or freezer for 4-6 hours to prevent gel phase. 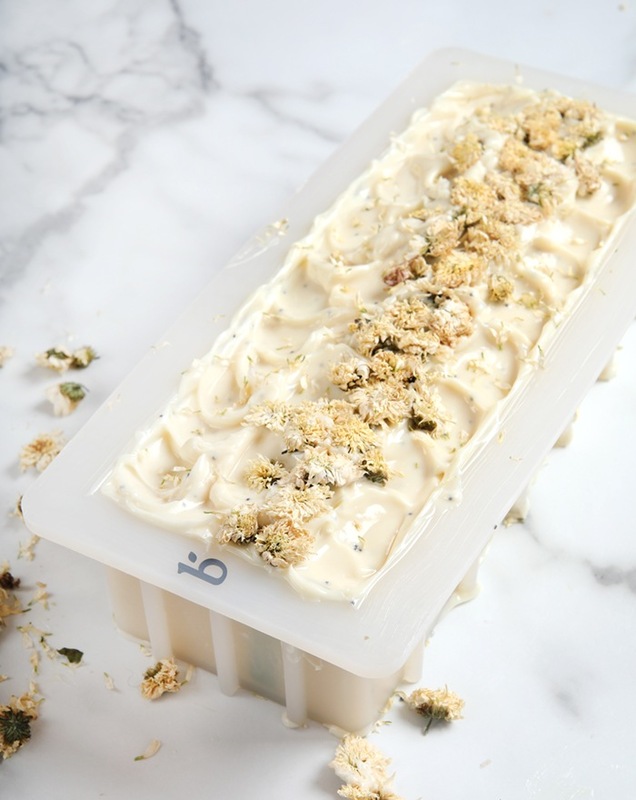 Allow the soap to stay in the mold for about 2-3 days. 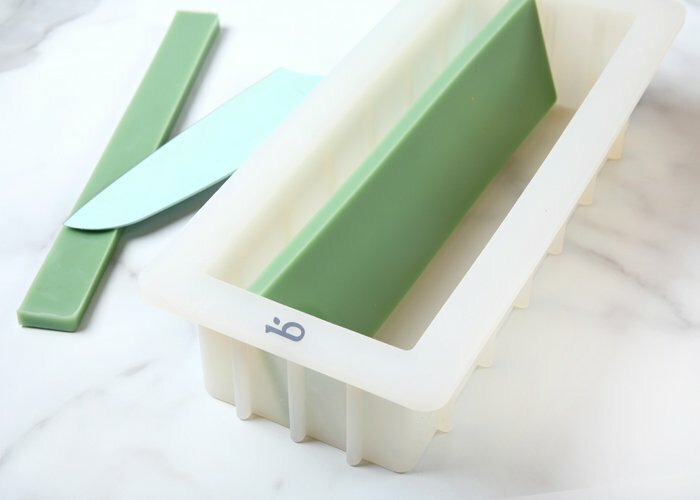 Remove from the silicone mold, and allow the bars to cure for 4-6 weeks. Enjoy!